1825mm high, aperture 1223mm, requires 1 door 1245mm x 596mm and 1 door 570mm x 596mm, includes 1 adjustable shelf. 1970mm high, aperture 1223mm, requires 1 door 1245mm x 596mm and 1 door 715mm x 596, includes 1 adjustable shelf. 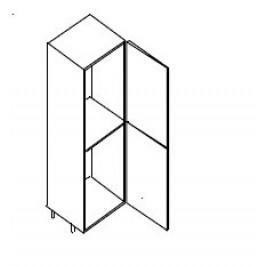 2150mm high, aperture 1223mm, requires 1 door 1245mm x 596mm and 1 door 895mm x 596mm, includes 2 adjustable shelves. All of the cabinets include PVC edging, BLUM Clip on Hinges and adjustable legs with sockets. The cabinets can be colour co-ordinated with doors at no extra cost.